The WIŚNIOWSKI brand has started a promotional campaign at cinemas, in which it shows gratitude to customers for selecting its products. The campaign refers to the “Let’s Save Little Hearts” campaign which supports the Cardiosurgery Center at the Children’s University Hospital in the Prokocim district in Kraków. The latest spot can be enjoyed on the screens of repertory cinemas around Poland. The cinema campaign is a new step in the promotional activity of the WIŚNIOWSKI brand. Up until now, all its advertising spots were screened primarily on TV. The choice of the silver screen lets us target a specific audience even better and improves the chance the message being remembered. As befits a cinema campaign, WIŚNIOWSKI invited a well-know and widely recognized young cinematographer, Piotr Sobociński, who worked for such productions as: “Wołyń” (Volhynia), “Bogowie” (Gods), and “Róża” (Rose), to produce it. The result is a 30-second spot telling the story of a 10-year-old boy. The main character has successfully battled a severe heart disease and decided to thank everyone who contributed to saving his life. These people include not only his doctors, but also all those who supported the hospital where he was operated. He leaves a heart-shaped cookie that he baked himself and a thank you note in front of the house of every person that helped him. It is no accident that the boy leaves his sweet treats everywhere where he notices WIŚNIOWSKI gates, garage doors, doors or fences. The spot is addressed to customers who purchased our products during the “Let’s Save Little Hearts” campaign from September to November 2017. 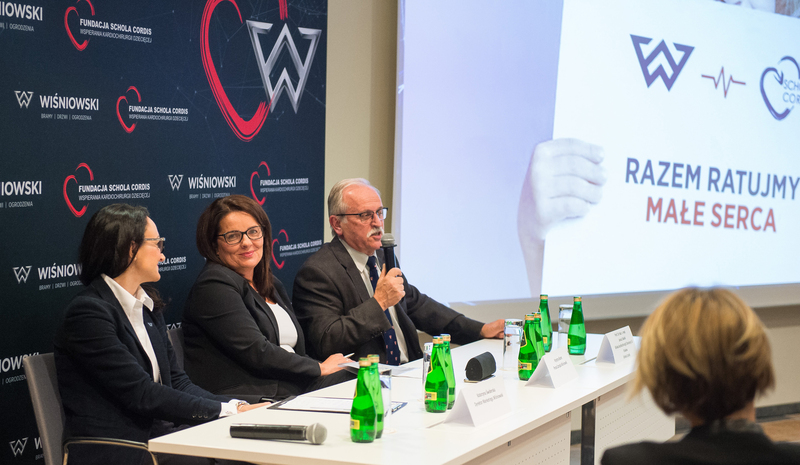 WIŚNIOWSKI and its sales partners will transfer 1% of sales to the account of the Schola Cordis foundation that raises money for the Cardiosurgery Center at the Children’s University Hospital in the Prokocim district in Kraków. The money will be used to buy specialist medical equipment to save children’s lives. 150 distributors from all over Poland have already supported our effort to give the best chance and treatment to the little patients. Both the spot and the entire “Let’s Save Little Hearts” campaign featured an eminent heart surgeon, director of the Cardiosurgery Center at the Children’s University Hospital in Kraków, professor Janusz Skalski, who studied under professor Zbigniew Religa. Professor Skalski reassures the audience that they can be a part of such initiatives by making small consumer choices. The ad will reach viewers in as many as 237 repertory and independent cinemas all over Poland. The spot will be shown before the screening of selected films until 4 January 2018. It will be enjoyed by several hundred thousand viewers. The film is also available on WIŚNIOWSKI’s official channel on YouTube. Apart from promoting the “Let’s Save Little Hearts” campaign on the silver screen, WIŚNIOWSKI also saw to it that information about the campaign would appear on air of the RMF FM radio, which also became the media sponsor of the initiative.